After the Beast is cleaned out, the photos are collated, the truck vault is re-organized and the weather begins to moderate, I usually look around and notice all the seasons are closed! Year after year, it takes me by surprise. At that point, I will retreat to my fall back position and enter field trials. My venue of choice is NSTRA, for many reasons, but mainly because that's what I started doing in 1992, and that's what I know. There are other formats out there. One of them is right for you. On the site of the largest gold mining operation in Georgia, not far from the Old Federal Road and the Trail of Tears, the Gold and Grass Farm of the Garrett family is perfectly situated for hosting a NSTRA field trial. Two good sized fields and one large field for the final hour were in excellent condition. The final hour field was un-touched, with no dogs or practice allowed. R.B. and Gary Garrett (the President and VP of the Region) graciously opened their farm to the Region a few years ago for a field trial. And, like poor relatives, we haven’t left yet. Once we saw the setup, we shamelessly begged and pleaded for more amenities. Gary built a clubhouse, hookups, and gallery warm-up areas. He drew the line at the swimming pool, restaurant and theater- much to the grumbling of the Setter crowd. No matter, as they soon forgot that issue in an argument over which Pinot Grigio complemented which Brie! Roll call produced 36 eligible dogs for Saturday’s cut. With plenty of daylight to play with, we opted for an 18 brace, one field event. Judges Steve Jaspering (Mid-South Region) andWesley Downs (Alabama Region) with Bird Planter Chuck Tash(Mid-South Region) did an excellent job! They kept us on the straight and narrow. Bodie Ray as the Field Marshal briefed every brace in the blind. The weather was cool to warm to downright hot, for a bit, on Saturday as the field was whittled down to only 16 dogs. There were some notable cuts that Saturday and some head scratching as the results came in. Dogs that performed so well all year long had a bad run, or a tough break. But, that’s trialing. Saturday night, over thick, grilled steaks and lots of laughs, we got down to some serious business as we hoodwinked, I meanelected, more people to serve as officers of the Region. R.B. and Gary agreed to stay as Pres. and VP. Brenda Keck will take over as Sec/Treasurer and Gerald Pannel will be our new webmaster (after a 20 year stint by Randy Schultz). The High Point Dog was Buddy/ R.B. Garrett, High Point Female Dog- Skeeter/Keith Koon, Rookie of the Year- Bryan Wynn, Sportsman of the Year- Dale Aldrich, Judge of the Year- Bodie Ray, Scott Clark Award-Angela Healan, and the Pearl J. Koon Award-Smoke/Gunnyon. Sunday started with rain and cool wind, what a contrast to Saturday! We began with 8 braces and cut down to the top 6 dogs. At the end of that, the top 6 were: Sadie/Howard, Hawk/Thornton, Snicker Pritchett, Skeeter/Koon, Ace/Schultz,Abby/Harrell. Once more, we ran three more braces to determine the top 2 dogs by points. At the end of that run, the standings on points were: Snicker/Pritchett, Sadie/Howard, Hawk/Thornton, Abby/Harrell, Ace/Schultz, and Skeeter/Koon. Snicker/Pritchett and Sadie/Howard went in to the Final Hour after a short rest. There was a lot of experience in both dogs and handlers here. Gene Pritchett, sometimes known as the Gator Man, has been all over NSTRA with Snicker winning and making friends. 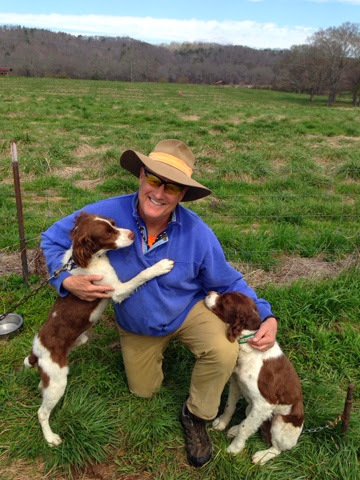 Keith Howard’s been winning in NSTRA for over 20 years with many dogs, including several Georgia Region Championships. This wasn’t the first rodeo for either one of these handlers and we settled in for some great action. The field sloped up from the gallery, so we could see a majority of it. The trucks were lined up in front of an old building (built around thetime of the war of northern aggression) that served as a Post Office, hotel and office for the gold mine whose shafts ran underneath the field in front of us. The skies were clear and the cool wind made for a comfortable day. Off the line, the dogs were primed and ready to go. In 30 minutes, 8 birds were on the card. In 45 minutes, 9 birds. When time was called, Snicker had 5/5 and Sadie 4/4. A careful check of the records indicated Snicker did not have a back during the trial! A “backing situation” was carefully setup as the tension mounted. Snicker is an outstanding dog. He is not known as an outstanding backing dog. But, that day, on top of an old, flooded gold mine in north Georgia, the 10 year old GSP eased himself in to a back that was not pretty- but, it was good enough, nonetheless. The 2014 Georgia Region Champion is 4-Time NSTRA Champion, 3-Time Georgia Region Champion Snicker/Gene Pritchett. Runner up, Sadie/Keith Howard, 3rd- Hawk/Gene Thornton, Jr., 4th-Abbey/Harrell, 5th-Ace/Randy Schultz, 6th- Skeeter/Keith Koon. We give a special “Thank You” to R.B. and Gary Garrett for the use of their historic farm, for the cooks and helpers and all the people who worked behind the scenes to make this great event happen. Thanks, especially to Purina, Garmin and Owens for their continued support of our favorite sport.